Hundreds of years ago, when a hankering for pie set in during winter and canned or fresh fruit wasn't available, clever cooks used the seasonal bounty they had dried at the end of the harvest and tucked them into a lard pastry for a tasty treat. Try this old-fashioned dessert that is experiencing a resurgence in popularity. The dried fruit in this classic recipe needs to be reconstituted, so start there. Next, prepare the pie dough. This recipe is made with vegetable shortening crust but a purist would use lard. Some other choices include all-butter or a butter-shortening combination. The choice is yours. This recipe makes about 18 hand pies and you will need about 1 quart of neutral oil like canola or vegetable to fry them. As always, when working with hot oil, make sure children are out of the way of splatters and have a fire extinguisher at the ready. Place dried apples in a heatproof medium bowl. In a medium saucepan, bring the apple juice or cider to a boil and pour over dried apples. Push down on fruit with a spatula or wooden spoon so all the pieces are submerged. Let stand for 1 hour. Transfer the apples and soaking liquid to the same medium saucepan you used in step 1. Bring the mixture to a boil, reduce the heat and simmer uncovered, stirring occasionally, for 10 to 15 minutes or till apples are tender and most of the liquid has evaporated. Watch carefully so apples don't burn. Remove from heat and let apples cool to room temperature. Roughly chop the cooled apples and, in a medium bowl, combine with sugar, cinnamon, flour, nutmeg and salt. Set aside. While the dried apples are reconstituting, see step 1 above, make the pie dough. In a medium bowl, whisk together flour and salt. Cut cold pieces of shortening into the flour-salt mixture until it resembles small peas. Sprinkle water over mixture, 1 tablespoon at a time, while gently bringing the dough together with the fingertips. Add more water, as needed, until the dough will clump together. Form the dough into 2 equal balls, covering them separately with plastic wrap, and refrigerate until ready to assemble the hand pies. Remove one of the dough balls from the refrigerator and turn it out onto a lightly floured work surface. Roll the dough to a 1/8-inch thickness. Cut out as many 4 1/2-inch-diameter circles as you can. Gather the scraps and re-roll and cut. Alternatively, you can use a dumpling maker gadget following the manufacturer's instructions. Place 1 heaping tablespoon filling into the center of each round of dough. Rub a finger moistened in water around the edge of half of the circle. Fold the dough in half, encasing the filling, to form a half-moon shape. Make sure to press out any trapped air and seal the edges either by hand crimping or with the tines of a fork. Place in the refrigerator so the dough will not become too soft while you make the rest. Remove the second dough ball from the refrigerator and repeat with the remaining filling. Refrigerate while you fry the first batch. Fill a cast-iron Dutch oven or deep, heavy-bottomed skillet halfway with neutral oil and heat to 375 degrees F using a deep-fry thermometer to gauge the temperature. Starting with the pies that were formed first, remove 4 to 6 pies from the refrigerator and drop them into the hot oil and cook until golden brown, about 5 minutes, flipping halfway through. Using a slotted spoon, transfer pies to a paper towel-lined plate. Repeat with remaining pies. The filling will be very hot so let the pies cool at least 5 minutes before serving them warm with a scoop of vanilla or cinnamon ice cream if desired. Or cool completely and drizzle them with an easy lemon glaze icing, salted or creamy caramel sauce, or just a dusting of confectioners' sugar. Note: The hand pies can be frozen for up to 6 months and fried while frozen for about 8 minutes (but watch out for significant spattering when dropped in the hot oil). Add some zing to your pies with these suggestions. The nutmeg works well with all these flavors so leave it in. Change it up by making some gourmet additions or easy substitutions. Replace part of the dried apples with an equal part of sweetened dried cranberries or raisins by weight and replace the 2 tablespoons flour with 2 tablespoons finely chopped walnuts. Instead of pie dough, use canned refrigerator biscuits flattened out and rolled 1/8-inch thick. Substitute 2 tablespoons of your favorite nuts (pecan, walnut, almond, macadamia, cashew, hazelnut) for the flour in this recipe. Make sure they are chopped relatively finely otherwise they will poke through the dough and the filling will leak out into the hot oil when frying. Bake instead of fry. Heat the oven to 375 degrees F. Place hand pies on parchment-lined sheet pans, brush with melted butter and a sprinkle of coarse sugar, if desired, and bake for 15 to 20 minutes. Instead of a fruit hand pie, consider making a fried meat pie like a Bolivian salteña or Mexican empanada. 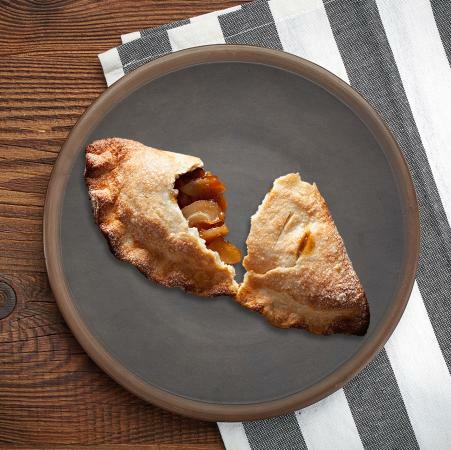 In farming and coal-mining communities, baked dried-fruit pies were formed into pocket size or hand pies that were easy to transport in a lunchbox or sack and could be eaten without a fork. When chuckwagon cooks on the range started to fry these desserts in beef fat, it soon became a popular way to cook them.